Over time, tooth enamel can become stained for a number of different reasons, from diets that are heavy in coffee and wine to unavoidable factors like genetics and age. 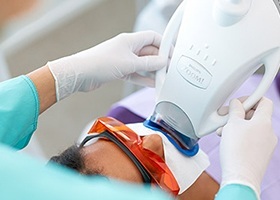 At Framingham Family Dental Care, our doctors are always happy to help patients refresh their look and achieve a better, brighter smile with ZOOM!® Teeth Whitening. This service comes in multiple forms that can be selected based on your personal preferences, and the results are always dramatically beautiful. Contact our Framingham, MA location today to schedule a first visit! Is speed a priority for you when choosing a teeth whitening procedure? Do you have an important event coming up where you’d love to look your very best? In-office whitening could be the best option! This process only takes an hour of your time, during which our doctors will combine professional-strength bleaching gel with a special light that enhances its whitening properties. When we’re finished, your smile should be anywhere from six to ten shades whiter, and we’ll provide you with a take-home kit as well for regular touch-ups at home. Of course, some patients don’t want to drastically change their smile overnight. Instead, they’d prefer to gradually improve it in the comfort of their own home and on their own schedule. In this case, a take-home kit can work wonders. Our doctors will provide you with a supply of potent whitening gel, oral trays that are customized for your unique mouth, and all the instructions you’ll need. Your job is then to wear the two components together as directed each day. This can be done whenever you have the free time, whether you’re getting ready for work in the morning or watching your favorite TV show at night after the kids are fast asleep. Many patients see improvement after only one application, with the most dramatic changes occurring after a few weeks of diligent use.